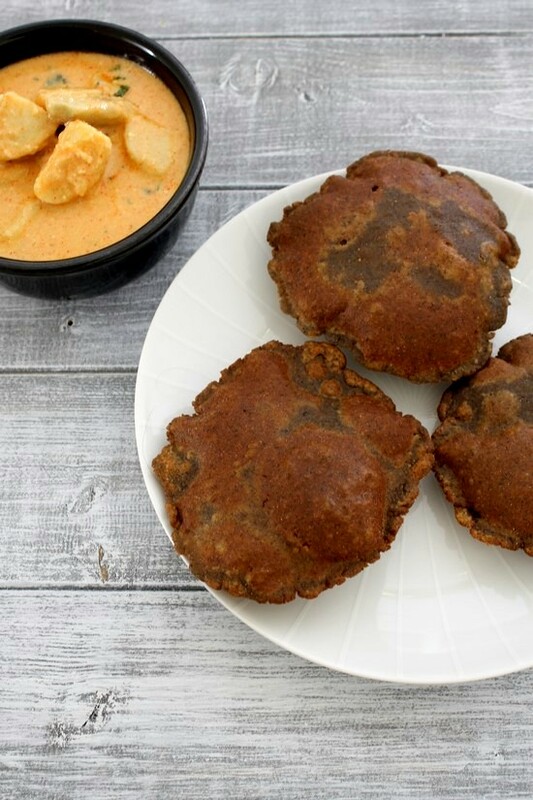 Kuttu ki puri recipe or vrat ki poori – a gluten free puri recipe dough is made with buckwheat flour and mashed potatoes and the deep fried into hot oil. During the Navratri vrat or any other Hindu fast or upwas like ekadasi, maha shivratri, janmashtami, some food are restricted and only few is allowed. These rules and tradition may vary from one family to another. 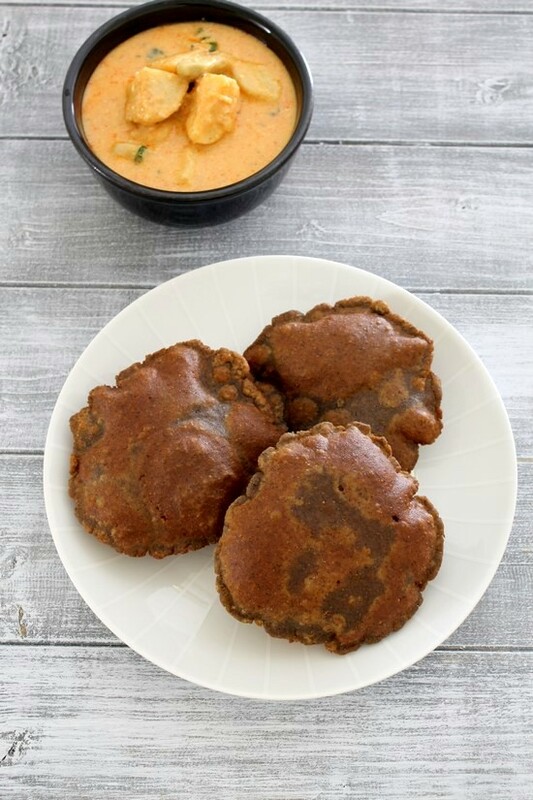 When it comes to the flour, few of them are allowed like rajgire ka atta (Amaranth flour), singhare ka atta (Water chestnut flour), kuttu ka atta (Buckwheat flour) and arrowroot flour. I have been grew up eating rajgira atta or singhare ka atta 90% of the time during the vrat. But kuttu ka atta is rarely used by mom. After coming to the USA, I have tried few recipes with this flour. And I like the taste of it. 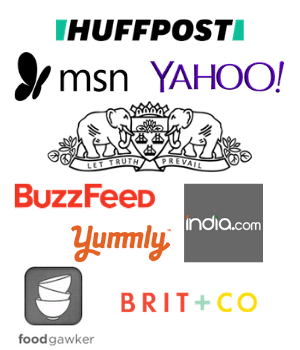 Kuttu ka atta is much more easier to work with compared to rajgira and singhare ka atta. We can roll this puri using rolling pin. While making rajgira ki puri and singhare ke atte ki puri, we need to pat it using hand to get the smooth edges and to prevent it from falling apart. Kuttu or buckwheat generates warmth in your body, so it is advisable to serve any dish made with yogurt on side. Because yogurt is cooling for your body. Here I have served this kuttu ki puri with dahi arbi. 1) If you have boiled, mashed potato handy, use that. I always have boiled potato in the fridge during the navratri vrat. If not, take a small potato, wash it well. Take into pressure cooker, add enough water, so potato is submerged in the water. Cover the cooker with lid, put the weight on. Turn the heat on medium and cook for 1-2 whistles or till the potato is soft. 2) Let it cool down to touch then peel the potato and discard the skin. Mash it or grate it well. Make sure there are no chunks of potato in it. It should be smooth and mashed properly. 3) Take kuttu ka atta in a bowl. Add salt and pepper. Mix well. 5) Mix it by rubbing between your fingers and thumb until it is incorporated well. 6) Now knead into a tight dough using warm water. Start with little water at a time. I used only 2 tablespoons of water. Cover it and let it rest for 15 minutes. 7) After that divide the dough into 7 equal portions. make smooth ball and flatten it between your palm. 8) Work with one disc at a time. Dust it with dry flour very lightly and roll into 3 inch diameter circle. 9) Now heat the oil in a pan on medium-high heat for deep frying. While oil is heating, roll few more puris and keep them on the plate. 10) Now check the oil, it should be hot. If you drop a small piece of dough into the hot oil, it will come on top immediately, meaning oil is hot. Slide one rolled puri carefully. slightly press in circular motion using spatula, so it will puff up. 11) Once puffed and lightly browned, flip it and cook another side. 12) Then remove it to a paper towel lined plate using slotted spatula. Serve kuttu ki puri hot or warm. Serving suggestion: During the vrat or Hindu fasting, kutti ki puri can be served with plain yogurt or side dishes like dahi arbi, dahi aloo, dahi suran ki sabji or raita. Kuttu or buckwheat generates warmth in your body, so it is recommended to serve with yogurt based dishes. Make sure to mash the potatoes very well. If there are tiny pieces of potato in the puri, it will not puff well. Roll the puri to even thickness. If it is uneven then it will not puff up while frying. Don’t make the puri too thin or too thick, It should be medium thickness. Fry the puris into hot oil. If oil is not hot then puri will absorb too much oil because of potato in it. Also it will not puff up. If you have boiled, mashed potato handy, use that. Or boil in pressure cooker for 1-2 whistles or till the potato is soft. Let it cool down to touch then peel the potato and discard the skin. Mash it or grate it well. Make sure there are no chunks of potato in it. It should be smooth and mashed properly. Take kuttu ka atta in a bowl. Add salt and pepper. Mix well. Add mashed potato. Mix it by rubbing between your fingers and thumb until it is incorporated well. Now knead into a tight dough using warm water. Start with little water at a time. I used only 2 tablespoons of water. After that divide the dough into 7 equal portions. make smooth ball and flatten it between your palm. Work with one disc at a time. Dust it with dry flour very lightly and roll into 3 inch diameter circle. Now heat the oil in a pan on medium-high heat for deep frying. While oil is heating, roll few more puris and keep them on the plate. Once oil is hot slide one rolled puri carefully. slightly press in circular motion using spatula, so it will puff up. Once puffed and lightly browned, flip it and cook another side. Then remove it to a paper towel lined plate using slotted spatula. nece kutt uatta puri …..